We’d love your help. Let us know what’s wrong with this preview of Eat That Frog! by Brian Tracy. To ask other readers questions about Eat That Frog!, please sign up. I am thinking to buy Eat This Frog. Is it a long read with tons of anecdotal stories? Or more like a straight forward book? Ken Lenoir No offense to Tom but it's a 2 hour read and I couldn't disagree with him more unless he outright lied about the book's page count. It is very…moreNo offense to Tom but it's a 2 hour read and I couldn't disagree with him more unless he outright lied about the book's page count. It is very actionable. The key insight is this: Find out the most important use of your time at each moment, or at least every day, and work on it until completion. There are other techniques for time management too like the 80/20 rule being applied to all your lists, determing "what one goal/task, if I achieved/completed it, would have the greatest positive impact on my life?" and working on that, a goal setting/achieving method, a prioritizing method for lists, determining your key result areas, what exactly you get paid for, what skills you need to increase your income, etc, etc. 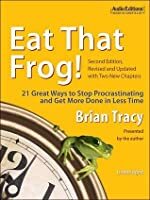 I've done Tony Robbin's RPM method, David Allen's GTD method, and the Meta Productivity method, and my own versions of to do lists, implemented other's recommendations, and I've gotta say that Eat That Frog trumps them all. A self-development book that seems like a long PowerPoint presentation, with tons of quotes from people I never heard of. So I'm supposed to be inspired and motivated by a certain Jonathan Smerkfeese who says "Procrastination. Such a bad, bad thing"? Step number one: Pick a title. Nothing revolutionary. Any mind-numbing sequence of words can turn into a title. The Princess i A self-development book that seems like a long PowerPoint presentation, with tons of quotes from people I never heard of. So I'm supposed to be inspired and motivated by a certain Jonathan Smerkfeese who says "Procrastination. Such a bad, bad thing"? Step number one: Pick a title. Nothing revolutionary. Any mind-numbing sequence of words can turn into a title. The Princess in the Dungeon? Sure! This could be a book about spotting pedophiles. Step number two: Start with an introduction filled with over-promises. Don't worry about under-delivering; it's the reader's responsibility to change, yours is to get them all psyched up about needing that change. Step number three: Come up with chapter titles, and dig for random quotes to use at the beginning of each chapter. Step number four: Write small paragraphs of supposedly motivating and inspiring bunkum. Write as many paragraphs as possible. Don't be shy, repeat the same point over and over again until you bring it home, then take it out again, then back home again. Step number five: Do not forget to throw in as many general statements as possible. "A lot of Americans think... All successful people say... Everyone knows that..." The fountain of credibility. This is it. Drink from it and quench everyone's thirst. Step number six: Include a step-by-step guide to something. Anything. The "step-by-step" part is irrelevant; the order doesn't matter. Step number seven: Come up with an acronym, then design a method around it. Like, from the top of my head, the S.N.A.C.K. method. What is the mighty S.N.A.C.K. method you ask? I'm glad you got that curiosity gene in you! S.N.A.C.K. stands for Stare Nonchalantly At Cute Kid. Learn to identify people with the S.N.A.C.K. behavior, and you got yourself a certificate, delivered personally from me, on how to spot pedophiles. Step number eight: Tell people what to do. Tell the reader to close one eye, lift an arm 67° in the air, lean on the fridge, and then proceed to remember all the people they saw in the mall that day, for potential pedophiles. Step number nine: Go crazy with formatting. Bold, underline and italicize. As Rose Taxtbeest says, "When you italicize words, you actually put pretty dresses on them." Step number ten: At the end of each chapter, no matter how short and irrelevant, present the reader with a quick summary. Then, add borders to that block of text. Whatever you said there has now become official and formal. That's it. If you can write/type, you can be an author. There is a readership out there for every kind of hokum. I finished this book a couple of days ago..........and I wanted to put a review in right away to get it in at the top of the week, but there was the Super bowl, then Monday I had to make dog food (you did read that correctly), last night Justified was on.....and that needs your full attention. This morning I had class for my Ballot Judge position for the primary March 6 (that promises to be a clusterf#¥k my friends). Now I'm stuck at work, and have to type this out on my IPad which is not the fa I finished this book a couple of days ago..........and I wanted to put a review in right away to get it in at the top of the week, but there was the Super bowl, then Monday I had to make dog food (you did read that correctly), last night Justified was on.....and that needs your full attention. This morning I had class for my Ballot Judge position for the primary March 6 (that promises to be a clusterf#¥k my friends). Now I'm stuck at work, and have to type this out on my IPad which is not the fastest way to type, so that's annoying. Customers keep coming up, wanting to buy something.....the nerve. Like majority of the human race, I have some procrastination issues,. So I thought I'd pickup the classic, but unfortunately named, Eat That Frog for some guidance. This book is full of great common sense tools to get yourself to do what you'd rather not do. Basically what you need to do is make lists. On the top of that list you put the thing you would rather avoid doing the most. This would be your "Frog". Then do that thing first, or eat that frog......then work your way down that list from the next slightly smaller, less ugly frog, down to prime rib, Oreos, tacos and cherry pie at the end of the list, if you could ever get there. This book is geared toward the work environment, specificity office type work, which is not what I do. I draw people for a living (from life), so when the author wrote about picking out the most difficult thing you would all day to do first, I imagined picking out the screaming two year old from the crowd first, followed by the stumbleing drunk......ect. So, I do plan to eat some frogs right after I beat a few people on Words With Friends. I read this book and I think its not bad. It is full of useful tools and tips to get you to stop procrastinating. But there are better books out there. The best book I've read on this topic is the Procrastination Elimination Method by John Isaac. It's not really famous.. its like a hidden gem. It addresses the core experiences and perceptions that cause procrastination to begin with. I give 3 stars to Eat That Frog because the author seems to have put in a lot of effort. Nothing revolutionary, but a good (and quick) recap of the things we need to do to get stuff done. The key premise is that if we ate a live frog first thing in the morning, everything else would be easy compared to that. It's a good reminder to concentrate on the most important task instead of getting mired down in the smaller, unimportant ones. 01. Set the table (spend some time writing out your goals for year, month and week). Prioritize those and Nothing revolutionary, but a good (and quick) recap of the things we need to do to get stuff done. 01. Set the table (spend some time writing out your goals for year, month and week). Prioritize those and concentrate on the most important ones. 02. Plan your day in advance (on paper). 03. 80/20 rule: 20% of your work will constitue 80% of your acheivements. Concentrate on that 20%. 04. Consider the consequences of what you choose to work on. 05. ABCDE method. Organize your tasks by value (a,b,c...) and priority (1,2,3...). 06. Focus on key result areas. 07. Obey the law of forced efficiency. 08. Prepare thoroughly. The 6Ps: Proper Prior Planning Prevents Poor Performance. If you're Rob Lowe you can use the 7Ps ;p.
09. Do your homework! If you're not improving, you're getting worse. 12. Take it one barrel at a time (baby steps). 14. Maximize personal powers. Select the key times of the day when you are most productive and work on your tasks at those times. 15. Motivate yourself (be your own cheerleader). 16. Practice creative procrastination. You're not going to be able to get everything done so put off the less important tasks. 17. Do the most difficult task first (eat that frog). 18. Slice and dice your tasks. Break your tasks into smaller, more manageable chunks. 19. Create large blocks of time to get your work done. 1. Write down your goals, set deadlines, list steps to achieve goals, organize steps into a plan by priority and sequence, do something every day on your highest-impact goal. Do now: list 10 goals. Pick your highest-impact goal, set a deadline, make a plan, take action. 2. Make a master list of everything you want to do, make a list for the coming month, make a list for the coming week and for the next day. When planning a project, list all the steps and organize them by priority an Think on paper. 2. Make a master list of everything you want to do, make a list for the coming month, make a list for the coming week and for the next day. When planning a project, list all the steps and organize them by priority and sequence. Do now: list everything to be done in the next 24 hours, list all projects. For each goal/project, prioritize and sequence the tasks involved. 3. Work on the 20% of the tasks that contribute to high value results first. Don't clear up small tasks first. Do now: list key goals, activities, projects, responsibilities. Decide which 20% of these tasks will contribute 80% of results (Pareto principle). 4. Think long term: 5, 10, 20 years. 'The law of Forced Efficiency says that "There is never enough time to do everything, but there is always enough time to do the most important thing."' What are my highest value activities? What can I and only I do that will make a real difference? What is the most valuable use of my time right now? Do now: Work on the most valuable task right now. Do now: Abandon activities that aren't contributing to goals. 6. ABCDE tasks: A tasks are high priority, B tasks must be done eventually, C tasks might be nice, D tasks can be delegated, E tasks should be eliminated. Do now: go through your list of tasks and label them ABCDE. 7. key result areas of management are planning, organizing, staffing, delegating, supervising, measuring, and reporting. key result areas of sales are prospecting, building rapport and trust, identifying needs, presenting persuasively, answering objections, closing the sale, and getting resales and referrals. Do now: Determine your key result areas. Grade your performance in each area. Make a plan to improve in the areas where you're worst. 8. List the three most important goals in: career, family, financial, health, development, social/community, problems/concerns. Spend quality time at work and quantity time at home. 9. Prepare your workspace and get on with the job. Do now: clean your desk. 10. Take it one step at a time. Do now: select a goal you've been procrastinating on, list the steps, and do one. 11. Never stop learning. Read in your field one hour each day. Take courses and seminars. Listen to audio programs in your car. Do now: identify key skills that you need to learn and make a plan to learn one. 12. What are you good at? What do you do easily and well that is difficult for other people? Looking back at your career, what has been most responsible for your success in life and work to date? What have been the most significant frogs you have eaten in the past? What is it that you do that gets you the most compliments and praise from other people? What do you do that positively affects the work and performance of other people more than anything else? Do now: focus your plans so that you're doing the things you're best at. 13. Identify what is holding you back, what is the limiting factor. Do now: Determine the constraint that is most impeding your progress toward your most important goal. 14. Create your own deadlines. 15. Take care of your health:sleep, eating, exercise. 16. Practice positive self talk. Positive mental attitude: look for the good in every situation, 'difficulties come not to obstruct but to instruct,' look for the solution to every problem, think and talk continually about your goals. Do now: control your thoughts, accept responsibility for what happens to you, don't criticize or blame others, focus forward. 17. Don't become addicted to technology. Do now: Turn off technology for one hour in the morning and one hour in the afternoon. Take a day off each week from keeping in touch with the world through technology. 18. Break down tasks in order to feel good about making progress. Salami: outline a task in detail and complete a slice. Swiss cheese: work for 5-10 minutes on a task. 19. Schedule blocks of time and eliminate distractions. 20. Build up momentum as you work fast. Create your own sense of urgency. "Do it now! Do it now! Do it now!" or "Back to work! Back to work! Back to work!" Do now: When you are given a task or responsibility, take care of it quickly and report back fast. Brian Tracy gives simple and easily acted-upon suggestions for stream lining and maximizing your productivity. The title itself, Eat That Frog!, refers to completing the biggest, ugliest task you may have on your plate on any given day. If you do whatever that is first (the frog), in the morning when you're at your most energetic and before anything else distracts you, then at least you can say you got something done today. Most everything else will seem almost easy by comparison... at least, th Brian Tracy gives simple and easily acted-upon suggestions for stream lining and maximizing your productivity. The title itself, Eat That Frog!, refers to completing the biggest, ugliest task you may have on your plate on any given day. If you do whatever that is first (the frog), in the morning when you're at your most energetic and before anything else distracts you, then at least you can say you got something done today. Most everything else will seem almost easy by comparison... at least, that's the theory. At first, I thought all of the ideas in this book sounded almost too simple. But as the short audiobook continued, it became more clear just why Tracy is considered one of the leaders in his field of expertise. Taken altogether, this book gives someone the tools to turn their life around (if they're in a bad place) or take them to the next level, if they're already on their way. It's not just about learning tools to boost your efficiency, it's also about discovering what you do best and then prioritizing doing THAT to the best of your ability. The most intriguing idea in here, to me, was "practice creative procrastination". As we couldn't possibly get everything done that we ever have to do in one day, by doing the things that MUST get done, you can procrastinate on the things that won't sink the ship if they're left undone. You're doing things, yet not doing things and feeding the inner procrastinator. It's like having your cake and eating it too. I'm not a big procrastinator. What I am is a collector of ideas and methods. I'm always open to improving myself or the way that I do things. In fact, I can be too gung-ho when it comes to implementing some of the ideas I read in self-help books. For example, a couple years ago I changed my life through "the magic of tidying up" and was so successful at removing the knick-knacks littering the house that my husband thought I was moving out. But seriously, I can take things to the extreme. So, I'm encouraged that this book mainly consists of writing lists, scheduling and prioritizing tasks. That shouldn't freak out the hubby. And I do find myself doing other, less important things when a big, fat frog of a chore is staring me in the face. At least now, I'm aware of what I'm doing and knowledge is the first step on the road to change. This book may be better for doers than thinkers. I read it about a year ago, and really liked it. A lot. It gave me a good kick start to getting things done. But then procrastination crept back, and the frog effect wore off. I'm a right-brain thinker, so I probably should have just tattooed the saying on the back of my hand. I've just started reading "The Now Habit: A Strategic Program for Overcoming Procrastination and Enjoying Guilt-Free Play" by Neil Fiore, and it's a better fit for me. "Eat This book may be better for doers than thinkers. I read it about a year ago, and really liked it. A lot. It gave me a good kick start to getting things done. But then procrastination crept back, and the frog effect wore off. I'm a right-brain thinker, so I probably should have just tattooed the saying on the back of my hand. Yeah, so I'm just doing a little self-analysis on myself, and once that's done I'll be perfect, and I'll probably reread this book on occasion just to keep me on track. این کتابهای انگیزشی هم خوب چیزیان، به شرطی که یک مشوق واقعی و بیرونی هم برای غلبه بر تنبلی وجود داشته باشه، وگرنه صرفا خوندن کتاب ازت ی آدم بانشاط و فعال نمیسازه. این کتابهای انگیزشی هم خوب چیزی‌ان، به شرطی که یک مشوق واقعی و بیرونی هم برای غلبه بر تنبلی وجود داشته باشه، وگرنه صرفا خوندن کتاب ازت ی آدم بانشاط و فعال نمیسازه. "There is never enough time to do everything you have to do. You are literally swamped with work and personal responsibilities, projects, stacks of magazines to read....But the fact is you are never going to caught up. You will never get on top of your tasks"
The key is: Prioritize your tasks! That's the book in three words! But how?! 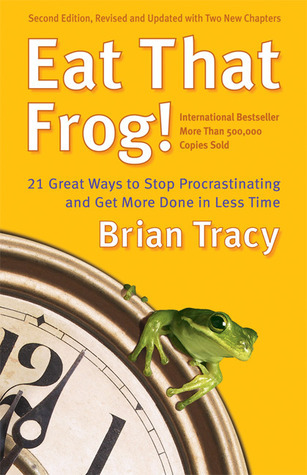 Brian Tracy will show you how in this book, Eat That Frog! The ugly one first! Very practical book. You would love this book if you actually applied the exercises thr "There is never enough time to do everything you have to do. You are literally swamped with work and personal responsibilities, projects, stacks of magazines to read....But the fact is you are never going to caught up. You will never get on top of your tasks"
Very practical book. You would love this book if you actually applied the exercises throughout the book, and re-read it again and again. Books that are for personal development or business require active reading, taking notes, and reading again, until the knowledge you learn becomes a part of you. I have an audio copy and I still listen to it every once on a while, whenever I feel I'm getting behind on some tasks, or whenever I stop practicing some of it's methods. This books helped me a lot and it still helping me all the time. From the ABCD method, the creative procrastination, developing plans, considering the consequences, and much more. كتيب بسيط مفيد للأشخاص الذين يعانون من الإهمال والتكاسل والمماطلة ،يقدّم الكاتب 21 نصيحة غيرت حياته جذريا ...فتحوّل من شاب ترك مقاعد الدراسة ، وعامل في الميناء إلى رجل أعمال يملك الكثير من العقارات والشركات وكاتب للعشرات من الكتب في مجال تنمية الذات وريادة الأعمال ..
- ضع خططا سنوية ، شهرية ،أسبوعية و يومية. -رتب مهامك اليومية في اليوم الليلة السابقة ورتبها من الأهم للغير هام . -ر كتيب بسيط مفيد للأشخاص الذين يعانون من الإهمال والتكاسل والمماطلة ،يقدّم الكاتب 21 نصيحة غيرت حياته جذريا ...فتحوّل من شاب ترك مقاعد الدراسة ، وعامل في الميناء إلى رجل أعمال يملك الكثير من العقارات والشركات وكاتب للعشرات من الكتب في مجال تنمية الذات وريادة الأعمال ..
-رتب مكان العمل ليكون كلّ شيء مريحا وجذابا ، وضع كلّ شيء أمامك قبل الانطلاق في المهمة. -لا يوجد وقت كاف لفعل كلّ شيء ، لكننا نملك وقتا كافيا لفعل الأشياء المهمة . -التعلم المستمر مطلوب للنجاح في أي مجال كان والتدريب اليومي على أمر معيّن يصنع فرقا جوهريا. -التفرغ التام لانجاز المهام الكبرى. 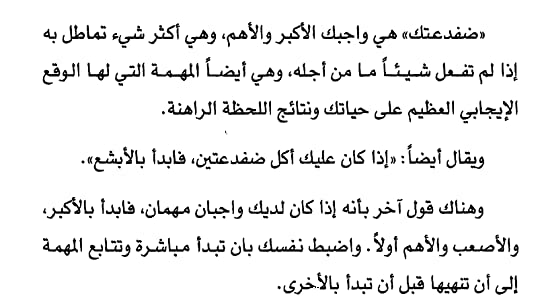 -اضغط على نفسك لتؤدي العمل حتى يصبح عادة ولا تنتظر أن يذكرك أحد دوما بواجباتك. - ضع وقتا محددا لانجاز كل مهمة أو نشاط. Brian Tracey puts together a book full of useful ideas on how to be more productive. His chapter summaries on p113 are a good resource to review. 7. Focus on key result areas: concentrat Brian Tracey puts together a book full of useful ideas on how to be more productive. I gritted my teeth through this whole book. Having just re-read the exceptional Getting Things Done: The Art of Stress-Free Productivity, by David Allen, this book felt poorly-written, poorly-organized, and poorly conceived. The author is brutal and his suggestions mostly make me want to run the other way. Get up early. Stay up late. Nose to the grindstone. Work work work work work work work. The most successful people work work work work work work work. He offers billions of made-up statistics I gritted my teeth through this whole book. Having just re-read the exceptional Getting Things Done: The Art of Stress-Free Productivity, by David Allen, this book felt poorly-written, poorly-organized, and poorly conceived. The author is brutal and his suggestions mostly make me want to run the other way. Get up early. Stay up late. Nose to the grindstone. Work work work work work work work. The most successful people work work work work work work work. He offers billions of made-up statistics (citing no sources) for what separates the productive people from the unproductive people. Ugh. Eat that frog: Do (or begin) the hardest thing you have to do or the thing you are the most inclined to procrastinate about first and then everything else you have to do will feel easier by comparison. 80/20: There are many things on your to-do list, but about 20% of them will have more of an impact on your life than the other 80%. Those are the ones you are most likely to procrastinate on, because they are the things that have the most weight to them, but they are not necessarily any more time-consuming than the rest of the tasks you have to do which will have less of a positive impact on your life. Aim to do more of the tasks in the 20% and de-prioritize the other 80% of the tasks. وأدق نقاط القوة التي تجعل منه منجزاً..
إلى جانب الرجوع إلى قراءته كاملاً مرة أخرى. إلا أنه كان بالإمكان جمعها في نقطة واحدة. If you follow the 21 rules, your life will be as productive as u wish. I haven't read many "self-help" books in my life, but I have to say that this one is the best of them all! This Tracy guy made some research, but not only that. He has many experiences and from them he shows us how to deal with time. This book is talking mainly about being great on your job, but you can take it for other things as well. Tracy is teaching us 21 steps that (combined in a way or another) can help us manage the time we have, how to stop wasting it away and start right away w 4,5 stars. Tracy is teaching us 21 steps that (combined in a way or another) can help us manage the time we have, how to stop wasting it away and start right away with the things that actually help us in life. This book is great! I want to reread it and study it more. Tracy teaches us about the ABCDE method, about how to take big things step by step, how to cut the quest in slices and many other great advice. It is called "Eat the Frog" because when you have a big issue to solve and you feel like not doing it, it's like a big frog in front of you. He has consulted for more than 1,000 companies and addressed more than 5,000,000 people in 5,000 talks and seminars throughout the US, Canada and 55 other countries worldwide. As a Keynote speaker and seminar leader, he addresses more than 250,000 pe Brian Tracy is Chairman and CEO of Brian Tracy International, a company specializing in the training and development of individuals and organizations. He has consulted for more than 1,000 companies and addressed more than 5,000,000 people in 5,000 talks and seminars throughout the US, Canada and 55 other countries worldwide. As a Keynote speaker and seminar leader, he addresses more than 250,000 people each year. Brian has studied, researched, written and spoken for 30 years in the fields of economics, history, business, philosophy and psychology. He is the top selling author of over 45 books that have been translated into dozens of languages. He has traveled and worked in over 80 countries on six continents, and speaks four languages. Brian is happily married and has four children. He is active in community and national affairs, and is the President of three companies headquartered in San Diego, California. “...you cannot eat every tadpole and frog in the pond, but you can eat the biggest and ugliest one, and that will be enough, at least for the time being.